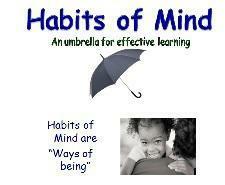 At St Bernadette's we use Thinking Tools every day to help us to learn and to prepare us for lifelong learning. Click below to find out more about how teachers plan using Thinking Tools at St Bernadette's. Thinking Tools are embedded in our curriculum to help us plan, question, organise, empathise and support our learning across the curriculum from Foundation Phase and throughout Key Stage 2. Click THINKING below to find out more about Thinking Tools at St Bernadette's. At St Bernadette's we use the Habits of Mind to think about the different skills and abilities we are using to complete activities and solve problems throughout the school day.Click HABITS OF MIND below to find out more about how we use the Habits of Mind at St Bernadette's. At St Bernadette's we use De Bono's Thinking Hats to help us think in different ways and to think from different viewpoints. 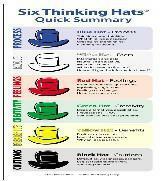 The 6 hats are all different colours and the thinker has to consider the viewpoints of that coloured hat. Click THINKING HATS below to find out more about how we use De Bono's Thinking Hats at St Bernadette's. At St Bernadette's we use the 8 different Thinking Maps in so many different ways and in so many different curriculum areas that it is easier if you have a look for yourself and think about how you could use them. 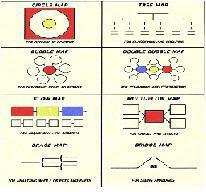 Click THINKING MAPS below to find out more about how we use Thinking Maps at St Bernadette's. At St Bernadette's we use the TASC wheel at the beginning of a Context or Area of Learning or to plan, organise and develop our ideas during DT, Art, Enterprise and Creativity Weeks. 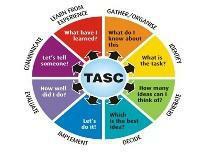 Click TASC WHEEL below to find out more about how we use the TASC wheel at St Bernadette's. 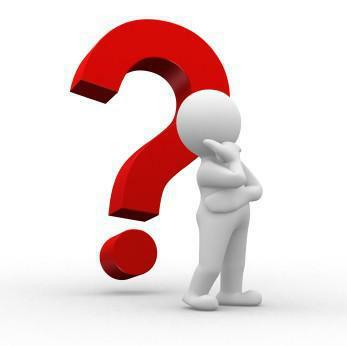 At St Bernadette's we use the Q Matrix to think of questions we need to ask to find out more about an area of the curriculum.The Q Matrix is used to develop higher order thinking and questionning skills. 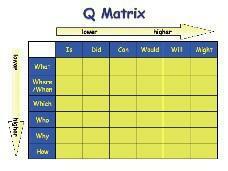 we need to find out and fill gaps in knowledge.Click Q MATRIX below to find out more about how we use the Q Matrix at St Bernadette's.